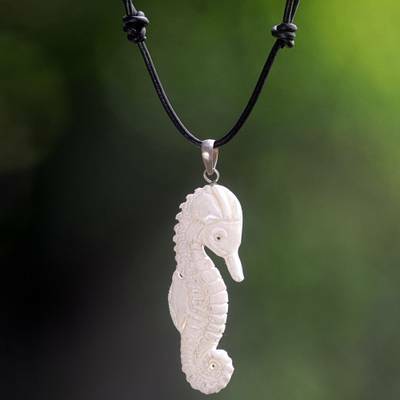 Hand Made Bone Pendant Necklace Sea Horse from Indonesia, "Timid Sea Horse"
The pendant of this necklace takes the form of a shy sea horse, hand-carved from a single piece of bone. Indonesia's Made Wardika designs this necklace, hanging the pendant from a leather cord of adjustable length. You can find bone pendant necklace 'Timid Sea Horse' by Made Wardika in jewelry categories such as Animal Themed Necklaces, No Stone Necklaces, Bone Necklaces, Leather Necklaces, Stainless Steel Necklaces and Pendant Necklaces. Enjoy exploring these sections for other Novica treasures. Very well crafted and beautiful.